Day 1 of Mad Cool Festival saw 30,000 people descend on land behind the Feria de Madrid complex in temperatures bordering on forty degrees for an evening headlined by Pearl Jam, but featuring a varied and diverse set of acts across eight stages. After a fractious entrance to the site, we made our way to the Mondo Sonoro stage where Gang Of Youths opened to about a hundred people at the start of their set with numbers swelling as people managed to get in over an hour after the advertised door time. 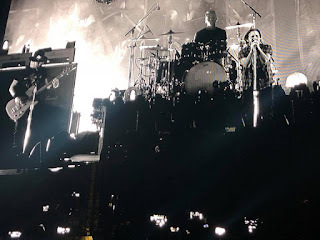 They're huge in their native Australia, selling out huge venues on multiple night runs, and it's not difficult to immediately see why, even if they have to counter some initial sound problems. Songs like The Heart Is A Muscle, The Deepest Sighs The Frankest Shadows and their final track the strident imposing What Can I Do If The Fire Goes Out were made for bigger stages and crowds than this, huge slabs of rock music that you can dance to. Frontman David Le’aupepe demands we do just that at one point, threatening to write to our parents if we don't, and leads by example, jumping about the stage with abandon, coming down to the barrier and then ending up amongst us, in our faces. 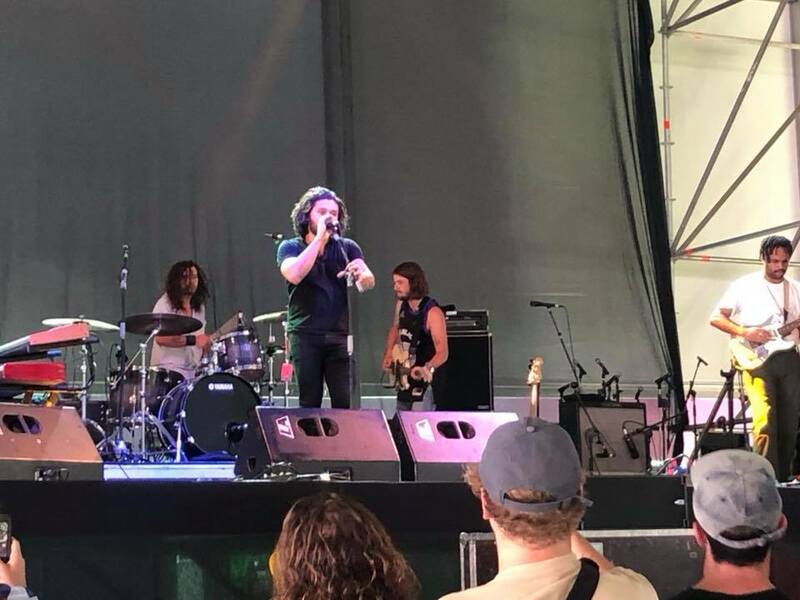 And that's what Gang Of Youths do best, an impressive opening to the weekend. 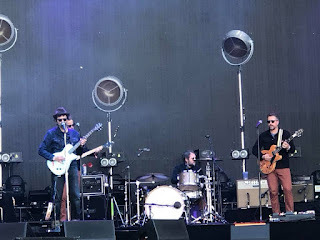 Next up for us are Eels on the second Madrid Te Abraza stage. 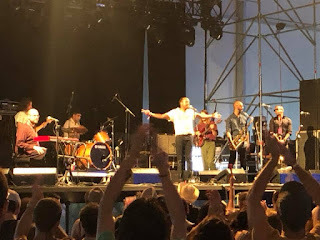 They delight the crowd with an hour's set of songs pulled from across their vast catalogue as well as an joyous cover of Prince's Raspberry Beret thrown into the mix as the second song. Stood in a sparsely populated VIP area we don't really get the atmosphere created across the barrier, but the response to the likes of Dirty Girl, Dog Faced Boy and a fabulous stretched Novocaine For The Soul, I Like Birds and Prizefighter shows the depth of love for a band that never sought to play by traditional rules. Mark's on good form too, commenting on The Chet's bongo playing on You Are The Shining Light and joking about his new castanets he plays for a few seconds a the start of My Beloved Monster and introducing new drummer Little Joe with a song that Joe sings about himself. The new material from their recent The Deconstruction album doesn't feel out of place either - Bone Dry, Today Is The Day and the aforementioned You Are The Shining Light standing up against the back catalogue heavyweights around it. We head to the Thunderbitch stage to catch part of Durand Jones And The Indications set. 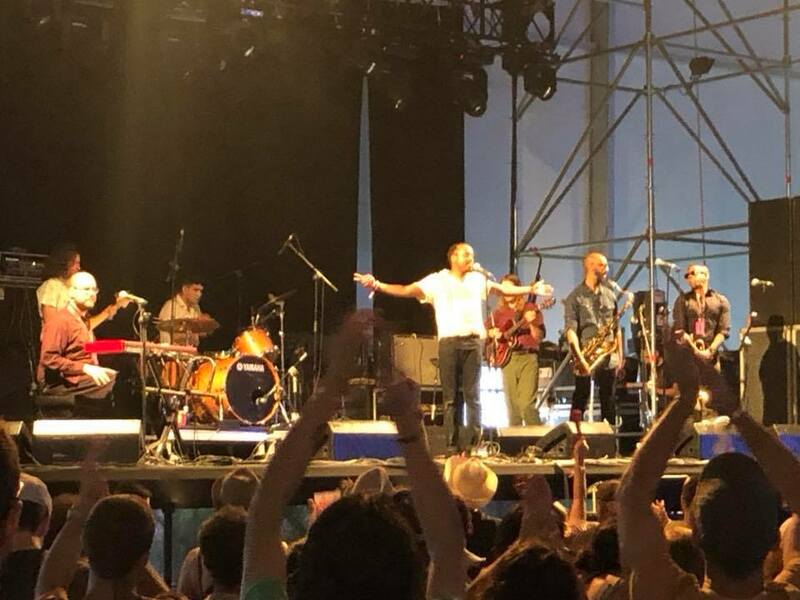 Apparently this is their first ever set in Spain, but they get an ecstatic response to their soulful brass-drenched invitations to dance which most of the assembled crowd do. Emotionally rich and deep vocals add to the feel-good factor of their music for those that have eschewed Tame Impala's visually stunning set outside the tent or are simply seeking respite from the heat. It's a million miles away from most of the rest of the day's entertainment, but probably the most fun. We stay in tent, turning round 180 degrees for Chile's Frank's White Canvas on the Mondo Sonore stage, recommended to us by a friend, and the three-piece create a thrilling post-punk thrash noise that it's impossible not to be drawn into it. 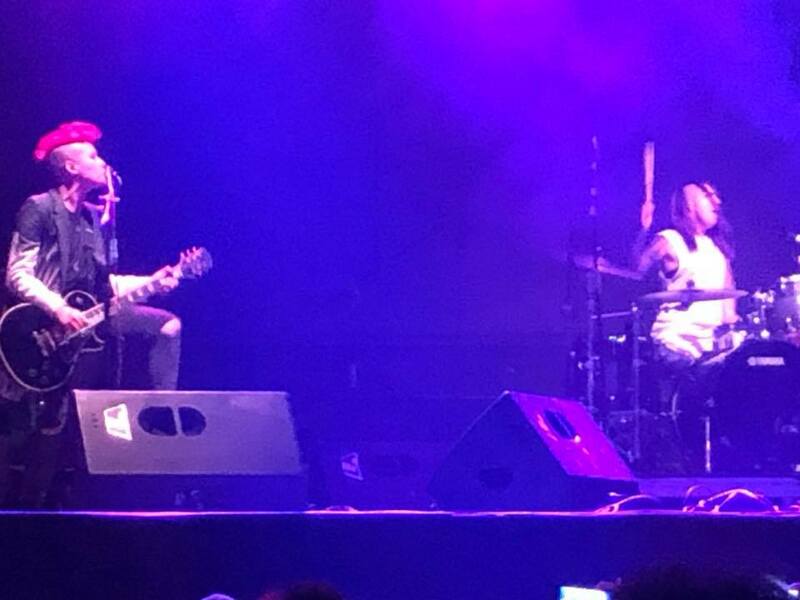 Visually striking in Kas's lead guitar and Leiva's drums (her sticks lit up in red at one point to almost match Kas's hair), they run through a forty-minute set that never takes it foot off the pedal. There's a Chilean flag being waved around in the crowd at one point, but the rest of us who are probably witnessing them for the first time can't help but be impressed by the intensity of their performance and that energy transfers from band to audience, the response getting stronger after each song. It seems like everyone is here for Pearl Jam, the crowd stretching as far back as the eye can see and an almost religious fervour sweeps the place as they open with Release, the first of seven songs taken from Ten in tonight's set. At a couple of points in the set, Eddie rages against the forces of sexism, racism and homophobia, warning their proponents that they're going to die out soon and take it with them to a deafening roar. As that dies down you wonder if Pearl Jam are going to take rock and roll with them when they go. This is such an intense performance of the most powerful music on the planet to an audience that is hanging on every note that you wonder in these times of laptops and programming and a richer more diverse musical culture whether a new band will ever reach these heights as Pearl Jam's audience grows old with them. As if to underline their points, they finish with a cover of Neil Young's Rockin' In The Free World that feels like it captures the spirit of everything that has gone before it. That's a question for another day though. Tonight's gig is about the now. There's so much energy here, both on stage and off, as Eddie and Mike make regular forays down to the barrier to soak in the adulation of the front rows. With twenty-four songs in the set, from nine albums plus recent single Can't Deny Me and another cover, this time of Van Halen's Eruption, there's very much a sense of giving the audience exactly what they want, a lean towards their earlier albums that made their name and even more vital since most of their peers have now departed the scene that started in their hometown in Seattle and spread like wildfire across the world. It'd be impossible to select highlights from a set that started with a bang and never once drifted into mid-set monotony. At points Eddie reads from handwritten notes in Spanish; if Bono did this it'd feel crass, but he pulls it off because the audience sense the genuine intent in him doing so. There's a point where they help a couple to get engaged which again feels like a conversation between friends rather than a break in proceedings in front of thousands and thousands of people in a baking hot field. This is the power of Pearl Jam though, this is how you do big stadium gigs without losing your principles and by staying real and true to your roots and being yourself. 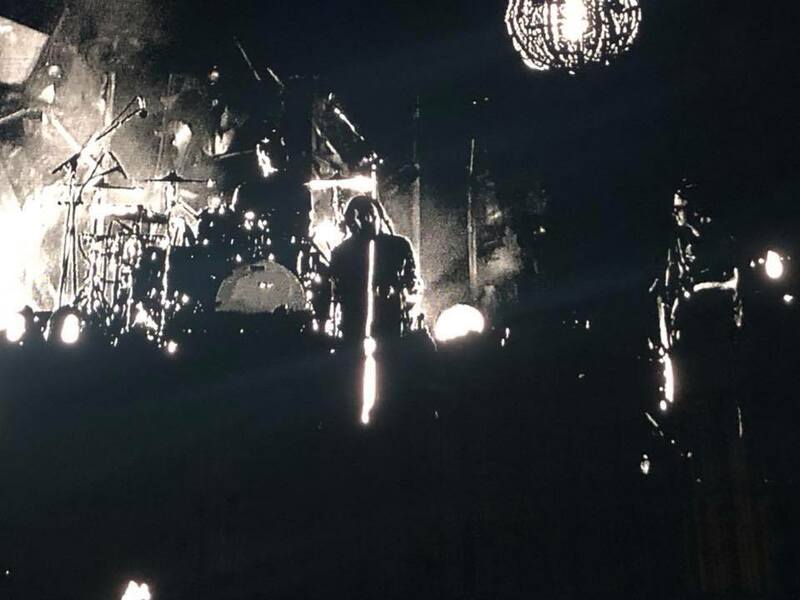 Pearl Jam played Release, Elderly Woman Behind The Counter In A Small Town, Given To Fly, Lukin, Corduroy, Why Go, Animal, Even Flow, Mind Your Manners, Lightning Bolt, Eruption, Jeremy, Can't Deny Me, Do The Evolution, Wasted Reprise, Better Man, Porch with an encore of Just Breathe, Sirens, Black, State Of Love And Trust, Rearviewmirror, Alive and Rockin' In The Free World. Gang Of Youth's website can be found here and they are on Facebook and Twitter. Eels' website can be found here and they are on Facebook and Twitter. Durand Jones And The Indications' website can be found here and they are on Facebook and Twitter. Frank's White Canvas's website can be found here. They are on Facebook. Pearl Jam's website can be found here and they are on Facebook and Twitter.